Do You Need to Payoff Debts Faster? Struggling with unmanageable credit card debt is the reality for many consumers in California and across the country. 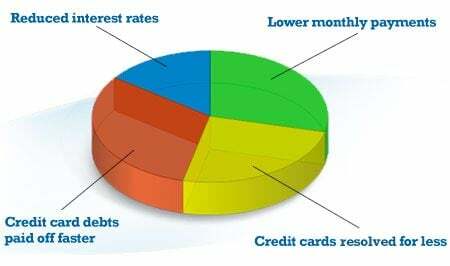 While many individuals and families struggle with credit card and other unsecured debts from time to time, when it becomes more and more difficult to pay off credit cards or pay down debts, what begins as a temporary situation can easily reach a crisis level and become a way of life. Symptoms of out of control debt are high interest rates, minimum payments that are harder and harder to make each month, or even using credit cards to pay for some of the essentials in life - such as gas, food, or medicine. Find out if help is available through a structured debt relief plan coordinated through a BBB-accredited debt relief provider. Answer a few simple questions online to Request Your Free Debt Evaluation and Savings Estimate. With the help of a credit counselor or debt counselor, consumers can seek debt consolidation, or a debt management plan (DMP) to help pay down or payoff credit card debts on an accelerated schedule. The goal of debt consolidation is to combine or "consolidate" all of one's credit cards and other unsecured debts into a single, more convenient, more manageable payment each month. This payment is made to the debt consolidator who then distributes the payments on time month after month to creditors until debts are resolved. What Are the 1-2-3 Steps to a Debt Management Plan? The above benefits of debt relief which must first be approved by creditors can save consumers a substantial amount of money may be the key to helping consumers get out of debt in less time if credit cards terms included the higher interest rates and only minimum payments were made month after month. If you need to payoff debts or get out of debt on an accelerated timetable through the benefits of lower interest rates, find out if help is available through a structured debt relief plan from a BBB-accredited debt provider. Get your free debt evaluation and savings estimate. Seeking a debt management plan (DMP) coordinated through a debt counselor can be powerful and effective in resolving debts, if a consumer can "stay the course" of the plan. When consumers acknowledge that they have a spiraling debt problem and agree to reach out for help, they must first agree to stop using credit cards. By "freezing" their debt level, essentially half of the problem is solved. Then, existing principal amount of debt is paid off month after month on time, and hopefully, at a significantly reduced interest rate. That means more of a consumer's payment each month goes to attack the principal amount of debt until the debt is completely resolved and the debt-free day is celebrated! Debt Relief is Simple Math - Does It Work? Although debt consolidation or debt management plans (DMPs) are so basic and "simple" to grasp, are they truly effective in helping consumers get out of debt? The answer is "yes" if enrolled consumers maintain the discipline necessary to set aside the funds needed each month so the debt services provider will be able to distribute payments month after month to creditors. However, many people who do get into serious debt often find themselves in that money crisis in the first place because they don't practice good budgeting and spending habits. Therefore, continuing those habits, no matter how effective debt management programs are, will not be successful. However, the good news is that debt management plans have saved thousands of dollars and been a lifesaver for many individuals and families who simply decide it's time to put the cycle of debt behind them and do what's necessary to change spending habits to regain control of their financial future. 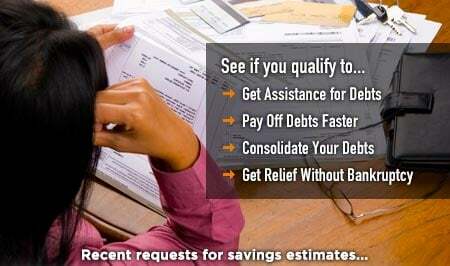 To learn more about your debt relief options and how a debt consolidation program coordinated by a BBB-accredited provider can help, answer a few simple questions and Request Your Free Debt Analysis and Savings Estimate. Will Debt Settlement or Debt Negotiation Help? It's important that consumers understand that when they stop paying cards according to the terms of their agreements, creditors can threaten or take legal action. In addition, money that is saved by settling for substantially less is subject to taxation. Finally, debt settlement will normally have a negative impact on personal credit, but not as serious or long lasting an impact as personal bankruptcy. If you are struggling with credit cards and other unsecured debts and in need of debt relief assistance, learn more about your debt relief options and get a free debt relief analysis and savings estimate at no obligation. Although the state of California does not provide debt grants or programs to help consumers pay off their debts, it does provide a variety of programs for individuals and families who are low-income or need a helping hand while experiencing difficult circumstances. These programs are specifically designed to provide more immediate financial assistance and relief, and helps individuals and families with children get access to food, healthcare, and other basic necessities. California also has agencies that can assist with housing concerns and help consumers avoid foreclosure. To learn more about these services, go to the state's homepage and click on the Benefits page. Although so many California residents and others across the country are truly overwhelmed with credit cards and other unsecured debts, help is available through a variety of options. Keep in mind that because every individual's debt situation is unique, it's wise to compare and contrast all of your debt relief options, do your due diligence, and take the time necessary to review all your options. Gain a clear understanding of the debt relief program or plan you are evaluating, the BBB accreditation or standing of the debt provider, how much you could save, and how long it will likely take for you to realize those savings. Although debt relief does not make debts magically go away, debt relief can and has helped many individuals and families get out of debt faster, save a substantial amount of money, and put the cycle of debt behind them. It is a proven plan that can put you on the path to financial freedom and that fact alone can not only save thousands of dollars but years and years of stress and discord.